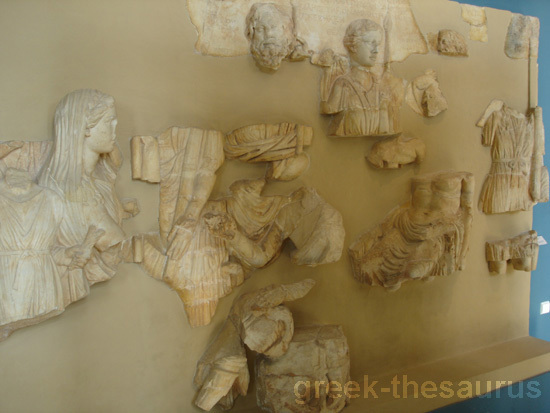 The archaeological museum of Eleusis. 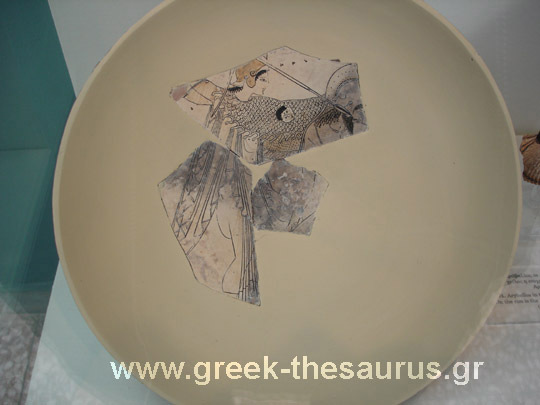 The museum is located inside the archaeological site of Eleusis. Built in 1890, by the plans of the German architect Kaverau, to keep the findings of the excavations, and after two years (1892) was extended under the plans of the Greek architect J. Mousis. The most remarkable collection of objects dated from the 5th century BC, when the reputation of the temple had been panhellenic, and the the number of believers who moved there in order to attend the ceremonies of the Eleusinian mysteries had been increased significantly. 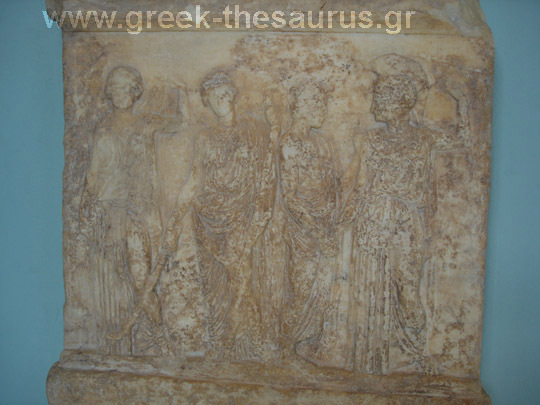 Great eleusinian relief. Pentelic marble. Found in Eleusis. This is the largest and most important known votive relief. Dedicated to the sanctuary of Demeter and Kore at Eleusis, it represents the Eleusinian deities in a scene of mysteriac ritual. 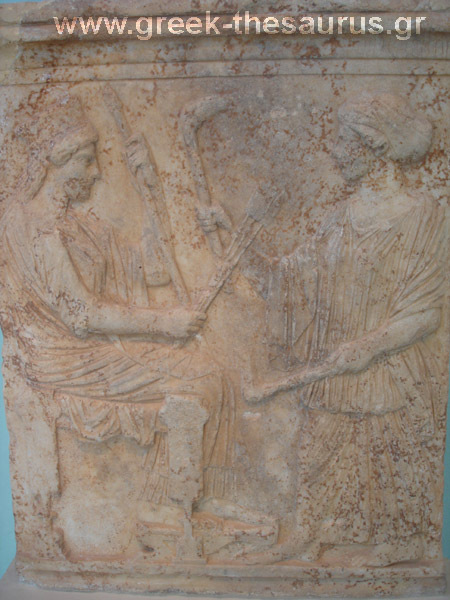 At left Demeter clad in a peplos and holding a scepter in her left hand, offers ears of wheat to Triptolemos, son of Eleusinian king Keleos, to bestow on mankind. At right Persephone, clad in and mantle and holding a torch, blesses Triptolemos with her right hand. The magnificence of the image and particularly the large scale of the relief suggest that it was not a simple votive dedication but rather associated with cult. The relief was apparently famous in antiquity and was copied in the Roman period. 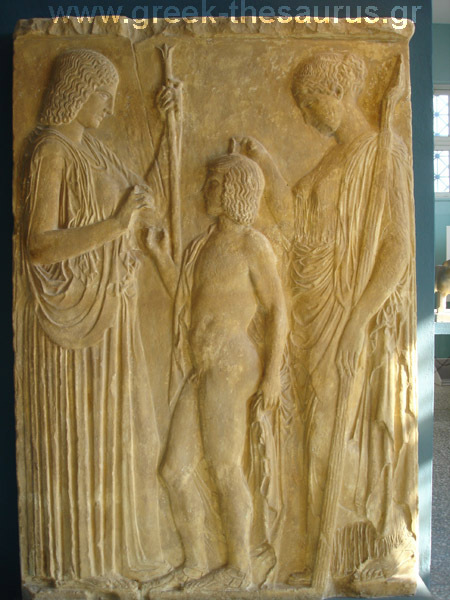 Copy of the Great Eleusinian votive relief from 5th c. BC. now in the National archaeological museum. 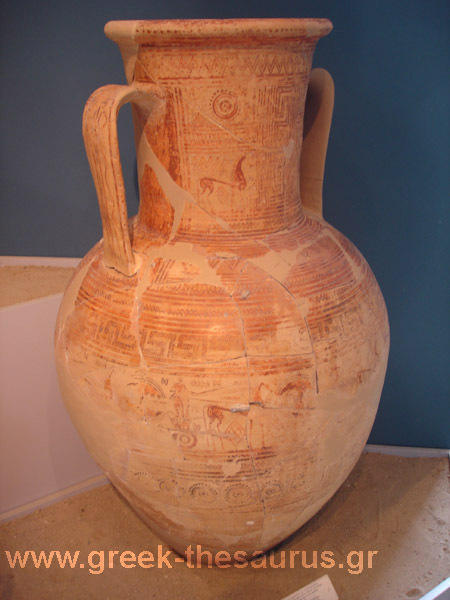 Eleusis amphora. 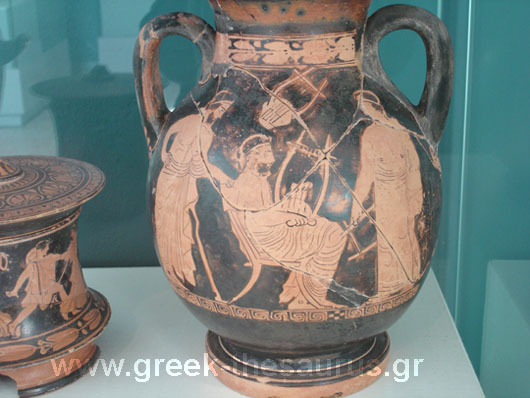 On the neck is a depiction of the blinding of Polyphemos by Odysseus and his companions. On the body there is a scene of Perseus beheading the Medusa. 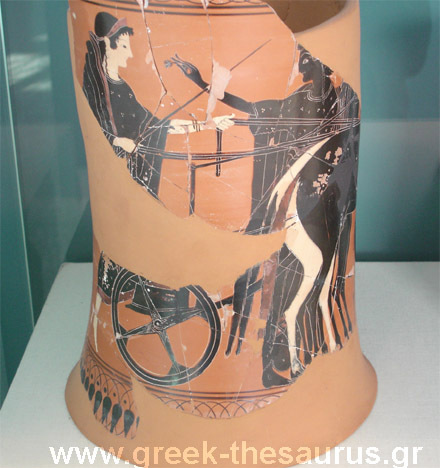 Eleusis amphora from 7th c. BC. 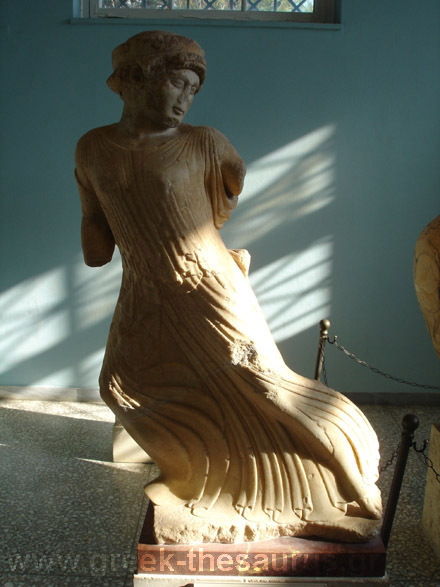 Archaeological museum of Eleusis. Eleusis large votive relief. Depicting Demeter seated on a throne and Kore standing and holding torches. Eleusis large votive relief from 5th c. BC. Terracota votive plaque. Dedicated by Ninnion to the two great goddesses of Eleusis. The figures in the main scene are arranged in two rows. At the top Demeter seated on the secret cista , Persephone standing and holding the torches and the torchbearer Iacchos respectively below, receive the procession of initiates, men and women, arriving at the Sanctuary. In the middle of the lower row the wreathed omphalos and two intersecting bakchoi, symbols of the mystery rites. The third divine figure, sitting at the bottom right has not been securely identified. The pediment depicts figures of participants in the pannychis, the all-night feast, while the female figure on the left accompanies them playing flute. All worshippers are crowned and hold blessoming branches and staffs, while the women have the sacred vessel, the kernos, fastened on their heads. Eleusis large relief. Dedicated by the priest Lakrateides and his family to the Eleusinian deities. It depicts the legend of Triptolemos. Eleusis large relief of 100-90 BC. Relief of Persephone. 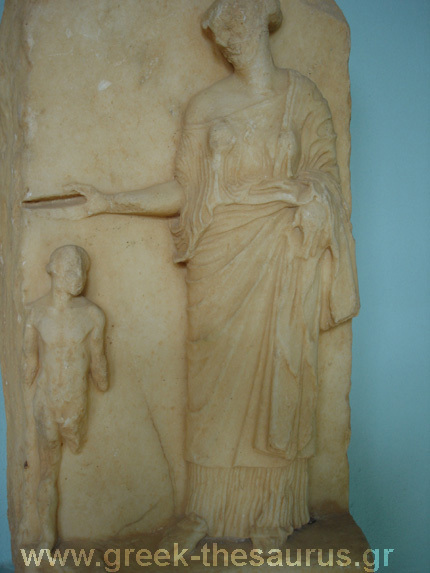 Relief of Persephone purifying a young initiate. 4th c. BC. Relief decree. Relief with decree referring to the bridge over the lake of Rheitoi. 421 BC. Fleeing maiden. From the pediment of the Sacred House. 490-480 BC. Part of a kylike. Depicted Athena in Gigantomachy. 5th c. BC. 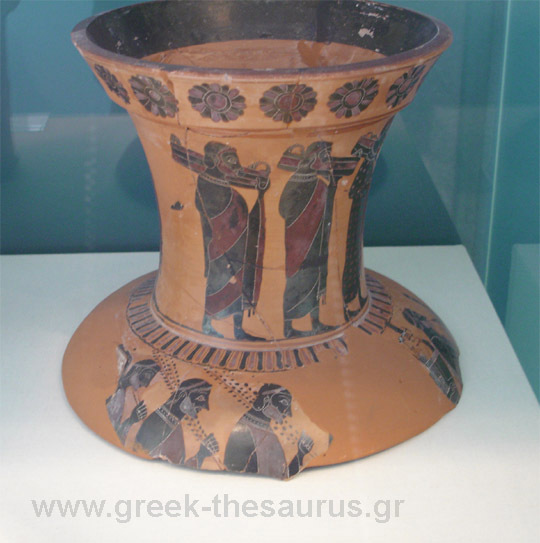 Eleusis black-figure krater. Telesterion. 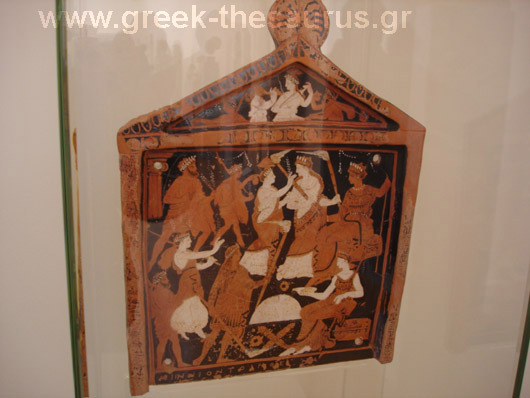 With depiction of a four-horser chariot and goddess Demeter. Next to her Apollo plays his quitar and offers her a flower. About 520 BC. Amphora. 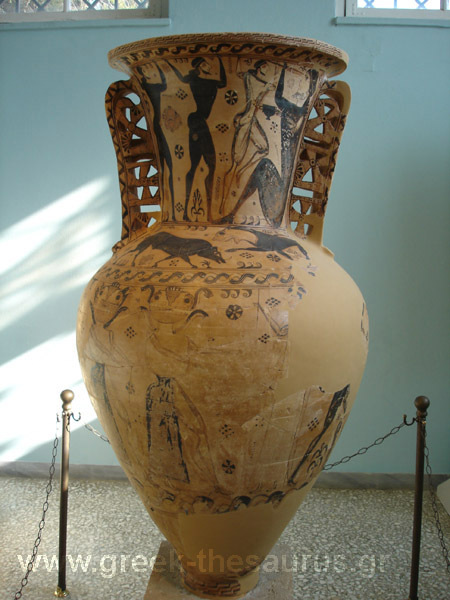 Amphora with geometric decoration, and with depiction of horses on the neck and a frieze of chariots and hoplites on the belly. 8th. century BC. Vase. 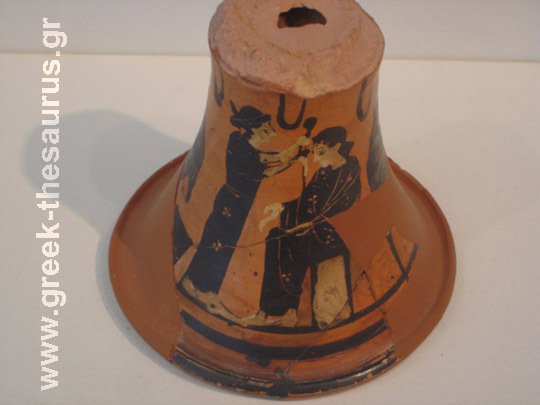 Part of a black-figure attic vase with a boudoir scene. 5th. cent. BC. Telesterion. Part of a loutrophoros. On the shoulder is depicted a procession of seven bearded men. Three of them are musicians, holding kithara and flute, the next three hold myrtle leaves , and the seventh carries a tripod. 540-520 BC. Attic red-figure pelike. With depiction of a seated man holding a lyre between two youths. 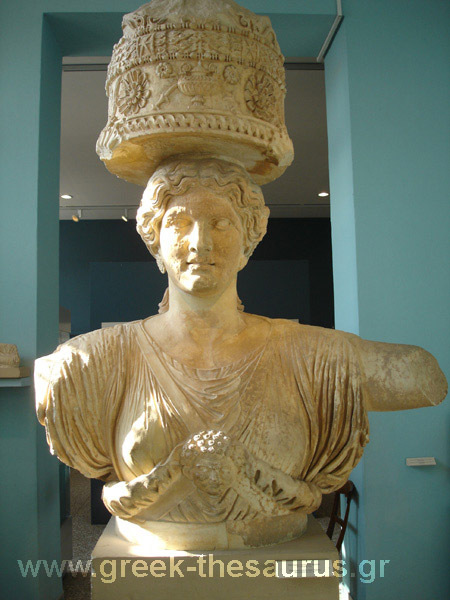 Statue of the Goddess Demeter. Probably from the workshop of Agorakritos. About 429 BC.